The Optician2020’s consortium has published the first leaflet of the project. Know about how Optician2020 is developing the technologies and processes necessary to demonstrate that the personalised spectacles business can be fashionable and, at the same time, a sustainable and profitable proximity manufacturing industry. Discover the main competitive advantages of Optician2020 personalised spectacles manufactured at the proximity mini-production centres! 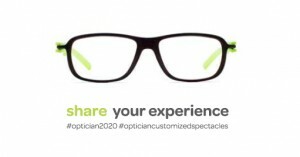 This entry was posted in News, Results&Downloads and tagged Leaflet, Optician2020 by Lucia. Bookmark the permalink.